If you’re lucky enough to see you parents into old age, you know its coming. For me it began August 2012, with a cancer diagnosis for my mom. Having just attended the funeral of our good friend who died from stomach cancer the week before, I knew how this story would end; with a little gray person gasping their last breath as they left this world. I also knew there could be a lot of life crammed into the between-time. I just didn’t know how long that between-time would be. And I knew she had to outlive my dad, who was 9 years her senior at 88 and very much counted on her to love and help him in his every waking moment. My mom knew this too, but neither of us said it out loud. Soon after August 2012, I came to the realization that not only would I have to make sure my parents lived well. I also had to make sure they died well. I was not in denial about the inevitable, but, like Scarlet, just preferred to “think about it tomorrow”. Besides, we were very busy with many doctors visits, surgeries, hospital stays, picture taking and memory making in the between-time. “Tomorrow,” however, came in December 2015 and then again in June 2016, when my parents passed away within 6 months of each other; my dad first…the natural order of things. The sequence of events, twists, turns, plans, unknowns, changes, red alerts, whens, hows and ultimate absolute clarity of what was to be…was dizzying and remarkable. The Serenity Prayer was my mantra for a time. I was fortunate, honored and determined to be present for each parent, before, during and after their bodies shut down. In vigilantly preparing for and guarding the sanctity of a peaceful ending, I felt every bit the Guardian Angel of the Good Death as each passed from this world with my sister and I “in loving attendance” as the obituaries for my mom and dad both read. It was absolute closure, the feeling of a pulse and then not feeling it, the belabored breathing with the steady metronome click… and then its absence. And then, the eggshell time immediately afterwards when ostensibly nothing has changed…except for everything. And since it was impossible for me to write these words just a few short months ago, I painted it. 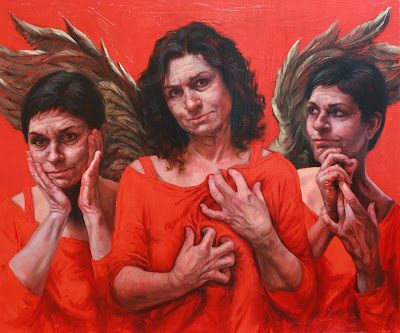 The painting was originally called Guardian of the Passage…attempting to politely skirt using the word “death.” But, just before submitting it last November, to the 58th Annual Mid-States Competition at the Evansville Museum in Indiana, I decided to call it what it was, and renamed the painting, Guardian Angel of the Good Death. She was accepted to the Evansville show and awarded a Merit Prize. An awesome Joseph Clark review of the May Show at Lakeland, its themes, its highpoints and its insights…in CAN Journal. Many of these stellar and thoughtful paintings shown and discussed and, I’m particularly excited that he spent so much time talking about “Guardian Angel.” Check out the review. I decided to throw my hat in the ring for the Jerry’s Art-o-rama Self-Portrait Online Competition and entered Guardian Angel of the Good Death. Click here to check out the competition and see if you can give her a yay vote!